Denny Jump (Bellevue, WA, United States) on 25 July 2014 in Landscape & Rural. The Niagara Falls are located on the Niagara River which carries water from Lake Erie into Lake Ontario. In the stretch of the river past the falls and towards Lake ontario, there is an area of swirling rapids called "The Whirlpools." 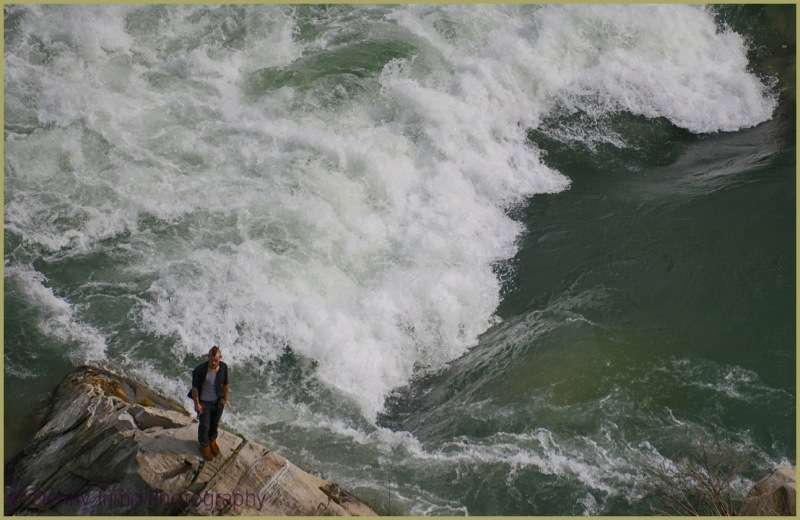 This fellow, with the "modern Mohawk, " appeared to have no clue about the potential danger of the whirlpools. One slip would create a major personal problem for him. Great shot. I like that you have included the guy into the picture. Oh this is grand ! I love the image and your compo, I can feel your diving eye and the tumultuous sea (so beautiful and powerful and impressive !) with this ideally framed guy standing quietly here ! Bravo, makes me breathe UP ! et surtout ne pas tomber!! That is pretty scary! I would be afraid of losing my balance and falling in! great perspective! the angry waters make for a superb backdrop and the guy looks like he is standing on the edge of the world! Some tourists are a little crazy. Cool shot though. just dropped in by chance - wishing you a wonderful holiday on the cape! i used to work there in the 70s, in chatham, to be precise, and have been back since then. what a gorgeous place !! !